If you’re in an industry that includes fluid mixing in its processes, you probably know that finding the right fluid mixer for your needs is critical to maintaining quality control, reducing costs, and optimizing efficiency. This determines the amount of fluid your tank can hold. This is important because it will determine the size and position of the fluid mixer and its mounting. This is “thickness” or “internal friction” of your fluid. It’s important because it will determine the impeller and horse power configurations. This is the density of the solid in comparison to water. It’s important because it will determine the type of pumping action that is required to adequately mix your fluid. This is the setting where your mixing will take place. It’s important because it can determine the type of power source and finishes. 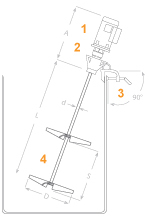 The fluid mixer you need depends on your process and the chemicals you use in that process. If you’re interested in learning more about mixing solutions for your process, post a comment or email us at [email protected]. Submit a quote request online, or call us directly at 1-877-331-0045 to find out how we can optimize the quality of your application results. Dynamix Agitators incorporates over 45 years of industrial mixing experience into its industrial mixer models and the processes they are part of. Our mixers and agitators are configured to suit your process and application. Business is smooth, responsive, and a pleasure. Dynamix was able to address and meet my needs regarding a drum mixer purchase, and responded quickly to any questions I had. Upon arrival, the mixer performed admirably and was well-fitted for the task. Sign up to receive technical publications and announcements from Dynamix.